We’ve gathered up a list of simple ways to show kids you care about them. Use them regularly and you may begin to find that the kids you interact with on a daily basis are happier and more likely to follow your guidance, all because they know that you care. Kids value your opinion and nothing lets them down like learning that you’ve lied to them. Little white lies, like “Wow! That’s a great painting,” are fine. Bigger lies that they could discover, “Like, I’d love to go to your game, but I have to stay late and grade papers,” are not. Even if their dream is to become a giraffe, encourage it. “I bet you’ll be the best giraffe there is!” Kids need to be encouraged to dream and think creatively. Little notes like “Keep up the good work” or “Great job on your presentation” will help motivate kids and show them that you notice them. You don’t have to give notes for everything they do. A little encouragement once a week or so will go a long way. Randomly take some time to pay them a compliment, even if it’s just something as small as, “I really like your sweater today.” This also helps kids know you notice them. If you’ve ever told a preschooler or elementary-aged child you’re proud of them, you probably saw a positive reaction. Kids have a desire to make grown-ups proud and hearing that they have done so gives them a wonderful feeling. Kids don’t always recognize that pointing out their mistakes is a way of showing you care. Instead they think, “I can never do anything right.” When you see little mistakes, let them go. Chances are the kids recognize them and are working on fixing them themselves. Just like kids don’t like it when you point out their mistakes, they don’t like to hear the word no. Even though your no may be justified, saying no too many times can give kids a negative feeling. Some experts suggest trying to say yes two or three times for every no. Usually when a kid is having a bad day, you can tell. While a hug or pat on the back can help, sometimes you just need to lighten the mood. Tell a joke. Point out something silly. Make a crazy face. Sometimes that’s enough to help kids redirect and forget about their bad mood for a moment. Kids love to sing silly songs, make silly faces, and enjoy other silly actions. Next time you’re singing that crazy song or reading a silly book, take time to make zany noises or motions. Kids need to know you’re not so stuffy and that you’re willing to let your guard down with them. Let kids know you’re happy to see them by giving them a smile. In the classroom, greet them with a smile in the morning and send them off with a smile in the afternoon. Whenever they catch your eye, smile to show you care. Of course you talk to kids every day, but do you take time to just let them talk? Take a few minutes to let kids tell you something interesting or share what’s on their mind. Respond to them appropriately, but let them do the majority of the talking. Making Barbie talk or rolling toy cars around of the floor may not be your idea of fun, but you should still take time to enjoy these activities with kids. Just five or ten minutes of play lets kids know you want to spend time with them. One of the best ways to let kids know you care is to take an interest in something they’re interested in. If they have a favorite TV show, learn the theme song and the names of the characters. If they have a favorite sport, know some of the rules of the game. Kids will be impressed when you can spout off some of this knowledge on the fly. Kids have opinions and love to be given the opportunity to express them. If you have a decision to make involving your home or classroom, give kids some input. This lets them know that their opinions matter. Many hands make light work, but when those hands are little, they can often make work take a lot longer. However, giving kids little tasks to do makes them feel important, so find ways they can help. The simplest tasks, such as zipping a coat or putting on a pair of shoes, can take forever with kids. Instead of constantly saying, “Hurry up” or showing other signs of impatience, stay calm and give them the time they need. Feeling safe is really important to kids. If you’re a teacher, you may have kids that have unstable home environments, so school has to be a safe place for them. Make kids feel safe by establishing rules, creating a cozy environment, and controlling your emotions when they’re around. Kids need adults to advocate for them. Let them know that you’re always in their corner by standing up for them when they’re wronged and by helping them fight their battles. However, don’t come to their defense so often that they don’t learn how to handle problems themselves. If kids participate in extracurricular activities or have a special event scheduled, take the time to show up. Nothing says “I care about you” more than having their teacher or parents show up to an event they’ve been preparing for. Showing up says that you care enough to give up some of your time for them. If kids draw you a picture or make you a gift, display it proudly. You can also put a picture of the child in a special place. Let them know that they and their work are worthy of being on display. Birthdays are a big deal for kids. Even if all you do is say, “Happy Birthday,” acknowledging their special day will show them you care. Even better, give them a special sticker, birthday hat, or a small birthday treat. Whether you’re a parent, teacher, or work with children in another way, you should take time to show them that you care. 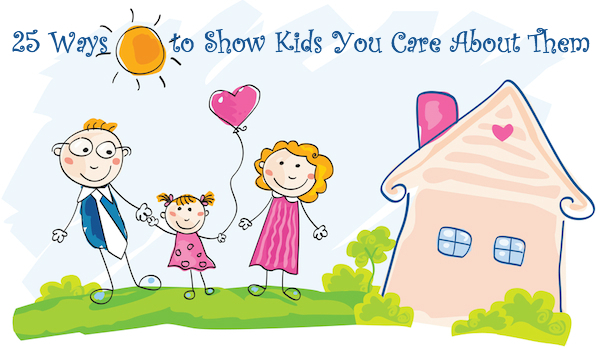 Do you have other ways to show kids you care? If so, share them with us so we can use them on the kids in our lives! Excellent! Thank you for sharing this great wisdom and insight! WILL DO MORE OF this!! Marvelous! Really I see this in my teaching life. You are a great writer. Thanks for sharing! Sometimes we get so involved in teaching that we forget the little things that matter to kids. This is so true. Tried this and they do better and want to do more. Brilliant post and so true!